Review: 'Ralph Breaks The Internet' Is About The Way We Live (Online) Now The sequel to Wreck-it Ralph is awash with jokes about cross-promotion, brand extension, comments sections and Disney clichés; it feels like the way we live now — with more heart. 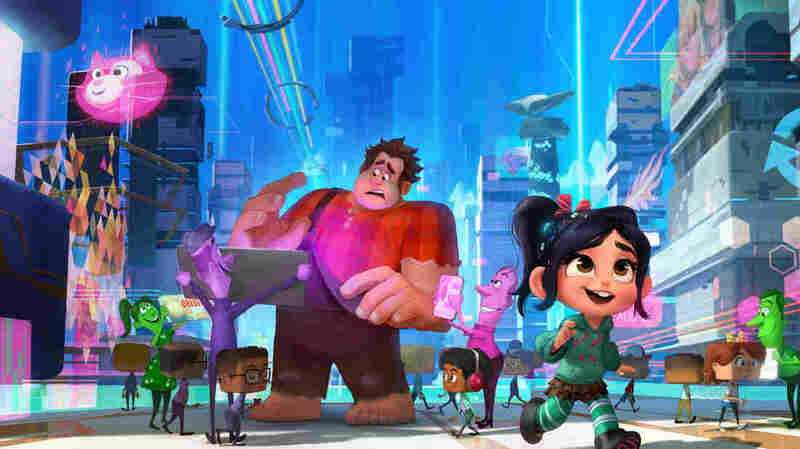 Ralph (voiced by John C. Reilly) wants things to stay the same; Vanellope (voiced by Sarah Silverman) has other plans in Ralph Breaks the Internet. In Ralph Breaks the Internet, a hyperconnected sequel to the animated hit Wreck-It Ralph, the possibilities of a Disney/Star Wars/Marvel crossover are breathlessly celebrated while fragile masculinity threatens to destroy the world. Cultural anthologists of the future will require no carbon dating to recognize this film as extremely 2018. In fact, as a screen grab of online and entertainment culture, Ralph Breaks the Internet seizes so shrewdly on the times that the prospect of watching it 10, 20 or 100 years from now is more exciting than seeing it in a theater today, when it feels too much like an animated extension of everyday stresses and distractions. Clickability isn't always a virtue. Rather than extend the arcade adventures of the original Wreck-It Ralph, directors Rich Moore and Phil Johnston, who also worked together on Zootopia, have chosen to get ambitious with the sequel by shaking off the 8-bit nostalgia and moving into the here and now. The shift does wonders for its main characters, Ralph (voiced by John C. Reilly) and Vanellope (voiced by Sarah Silverman), two affable outcasts from arcade classics who have no place outside retro fun centers. In the first film, Ralph longed to transcend his role as the blocky, lunkheaded villain of Fix-It Felix, Jr. while helping the spirited Vanellope conquer the glitch that could phase her out of a racing game called Sugar Rush. Tossing them in the sleek, open, ever-evolving world of the Internet underlines their obsolescence and allows for some sharp fish-out-of-water comedy. Connecting Ralph and Vanellope to Wi-Fi takes some doing, though the free associative plotting feels natural, like following a browser down some weird Internet rabbit hole. It starts with a busted steering wheel on Sugar Rush, which can't be replaced easily because the game and its parts have been out of circulation for years. In a desperate effort to save Vanellope's home, the two friends brave the unfamiliar vastness of the World Wide Web, zipping over to eBay and overbidding for a replacement wheel to send to the arcade. They try two different routes to raise the money: First by trying to steal a coveted car in Slaughter Race, a popular open-concept racing game led by Shank (Gal Gadot) and a crew of lovable miscreants, and later by producing viral videos with Ralph as their star. In the click economy, likes can be turned into dollars. Popular destinations such as eBay, Pinterest and Amazon make appearances in Ralph Breaks the Internet, along with a mishmash of BuzzFeed and YouTube called BuzzzTube, and a much-talked-about detour through Disney and its massive properties. There's an argument to be made that Moore and Johnston are simply reflecting the Internet as most experience it, but the film's lack of awareness or concern over cross-promotion and brand extension is its least-attractive quality. When Vanellope encounters a roomful of Disney princesses, the rapid-fire unpacking of longstanding tropes — from retrograde sexual politics to the weirdly specific requirement of gazing into "important water" — is a comic highlight. Yet this deft critique of Disney clichés can't suppress the icky aftertaste of corporate synergy, as if the writers' room had been invaded by the marketing department. Still, Ralph Breaks the Internet knows this digital terrain well enough to score some knowing laughs, like its run-through of videos that tend to tickle the algorithm (screaming goats, hot pepper-eating, bee puns, general human suffering), a Lynchian trip through the "dark web" and those irresistible online quizzes that tell us who we really are. On a deeper level, Moore and Johnston are keenly attuned to the miseries of overstimulation, those times when you feel hollowed out by the Internet's relentless endorphin rush or get caught up in the negative feedback loops of @-replies and comment sections. Even positive experiences can become too much, and negative ones are always lurking around the corner. For Ralph and Vanellope, logging off isn't a possibility, so the film is about them carving out a livable home for themselves, which puts them at cross-purposes. Moore and Johnston take a page from the last two Toy Story movies, which were about playthings that outlive their cachet, and the video game world naturally accommodates the shift from coin-operated stand-alones to the freedom of "sandbox" spaces in modern console and online games. The opposing trajectories of Ralph and Vanellope's friendship, fueled by their mutual insecurities and hurt, gives Ralph Breaks the Internet the little bit of heart it needs to keep from becoming mere product. So 10, 20 or 100 years from now, it's the one universal element that's certain to hold up.